An entrepreneur is “one who organizes, manages, and assumes the risks of a business or enterprise,” according to Merriam Webster. It is a role that takes a special kind of person—someone willing to go out on his or her own and face whatever obstacles may come along. Here, we present 25 South Jersey business owners who have stood up to the entrepreneurial challenge and successfully made a name for themselves in their respective careers. From a real estate developer to a software consultant, they aren’t just business owners—they’re outstanding entrepreneurs. As co-founder of Sora Holdings and principal of real estate firm SORA Northeast, Filipek has had his hands full for the last year with some of the area’s biggest building projects. For proof, there is the new and improved Glassboro Central Business District, which underwent a massive rebuild under Filipek’s watchful eye. But he’s not finished yet. Just look at America’s Sports Resort in Vineland. As a member of the sports complex’s executive team, Filipek has led the construction of the $350 million project that will include a 4-star hotel, water park, broadcasting space, and indoor and outdoor sports training facilities. Now with more than 35 years in service, Cipriani Remodeling has become a staple in South Jersey building and remodeling. The company has been under Cipriani’s dedicated care since its 1974 inception, completing more than 3,000 projects across Burlington, Camden and Glouces¬ter counties during his tenure. In fact, you’ve probably seen his name alongside a neighbor’s completed renovation or construction project, or even on television as Cipriani has offered his expertise on various shows on the Discovery Channel and the DIY Network. And his personal awards stand alongside more than a dozen accolades; he was even named the 2011 Remodeler of the Year by the Builders League of South Jersey. Eckhardt doesn’t do anything halfway. In 2011, he opened BlueGrace South Jersey, a third-party logistics company offering technology solutions to companies of all sizes and across all sectors, and from 2013-2014, grew the franchise by 72 percent and now has eight employees. BlueGrace South Jersey is also one of BlueGrace Logistics’ top five performing franchises and was recognized by the company with a 2014 Franchise of the Year Award. He’s also the founder of the Annual ARM’s Away Golf Outing in honor of his late mother-in-law, and has raised more than $87,000 since 2008, with all proceeds benefiting the Stacy Goldstein Breast Cancer Center at the Rutgers Cancer Institute of New Jersey. After working in his family’s life insurance brokerage firm for 10 years and constantly seeing policyholders in crisis because of unfair treatment from insurance companies, Sussman felt there was a glaring need in the marketplace for a firm that would advocate on behalf of high net worth individuals and corporations. So he founded CPI Companies in 1991, a firm that continues to develop individualized strategies for life insurance policyholders to guarantee proper benefits and mitigate tax exposure in their time of need. He and his partners also recently launched PolicyAudits.com, a website that helps evaluate life insurance policies from any carrier in the world. In the last decade, mobile apps have become a multi-billion dollar company in itself, and the Blumberg brothers have led the charge in the location-based mobile app industry. They founded Smarter Agent more than a decade ago, a company that has since become the largest mobile enterprise Software as a Service (SaaS) in real estate in the world. Smarter Agent works with international real estate powerhouses like Century 21, Berkshire Hathaway and Sotheby’s to provide localized content, including home information, photos and agent information, for around 4 million iPhone and Android users worldwide. With Brad serving as the CEO and Eric serving as president, the family continues to succeed, with an astounding three-year growth increase of 438 percent. Meanwhile, they continue to launch new apps designed to benefit not only the homeowner, but real estate agents across the globe. Atkins founded ACC, a software consulting firm that partners with some of the most well-known, business-related software names in the industry, including Sage, a global supplier of business management software for small and midsized businesses with customers numbering upward of 5 million worldwide. Atkins has also helped develop ACC into the largest authorized training center of Microsoft FRx Software, teaching in 18 major cities nationwide, and is continuously growing and adapting ACC’s offerings to meet the needs of all of its clients. Inspired by how land use design affects our living environment, DiVietro founded Land Dimensions in 1979, and since then the company has only continued to grow and expand its services to its clients, including land surveying, land use planning, site development engineering, landscape design and environmental engineering. With his more than 27 years of experience in land use management, DiVietro has been able to provide guidance for clients when it comes to any project, and he has learned to accommodate the changing trends of today’s social, economic and environmental needs, adhering to the notion that success is based on hard work and delivering great service to clients. It was 1999 when Masso and Torrence first crossed paths at the Philadelphia bank where they both worked. The two developed a strong relationship, and by 2002, they had decided to move on to a new bank in Marlton that was closer to family and could offer more to their clients. In 2008, they established their own firm, named Masso-Torrence Wealth Management, Inc., where they have capitalized on their strong dynamic and helped bring a wealth of new options to their clients. Regularly named two of 401KWire’s 300 Most Influential Advisors, Masso and Torrence are consistently working to grow their company and offer the best corporate retirement and comprehensive financial plans for physicians, dental professionals attorneys and small business owners. After starting his career in business development at T-Mobile USA, Polin successfully launched two successful companies in the wireless communications industry: Global West Communications and Global East Communications. His latest undertaking is OpDecision, which he founded with several partners before taking sole ownership in 2012. OpDecision is a leader in corporate wireless expense management, and can offer companies savings of up to 45 percent through “unpublished pricing, service credits and deep equipment discounts,” Polin says. The Penn State graduate cites his daughter as his biggest inspiration and envisions running several different businesses in the future. Davis, who grew up in Cherry Hill, joined the Army after high school and proudly served in the 1st Air Cavalry in Vietnam. After returning to South Jersey, he worked for a transportation company for 23 years, and when the business closed, he opened several offices for a company that specialized in recruiting for various sectors of the business world. Having established a strong background in transportation and logistics, Davis founded a driver recruiting firm with his brother, and in 2013, he moved on to yet another venture, Hire Edge Logistics Personnel (HELP). HELP has emerged as one of the leading staffing agencies in the region for driver, warehouse and logistics positions, stretching operations from Virginia to New York. DiMarino had founded and owned four enterprises by the time he earned his degree at The Wharton School of the University of Pennsylvania. After earning his degree, DiMarino began his professional career as a district vice president for Denver-based DocuVault Group, LLC, a records management and data vaulting company. In June 2008, he took control of DDV in West Deptford by buying out the Denver company’s stake, and since then DDV has been growing rapidly, earning over $1 million in annual revenue. Having learned early on from his parents that community involvement is as important as growing a successful business, DiMarino and DDV also donate their time and services to a number of local non-profit organizations. When Backal first co-founded Team Builders Plus with Merrick Rosenberg in 1991, the goal of the company was to help groups of individuals truly develop into teams. Today, Team Builders Plus has gone above and beyond that goal, helping individuals, teams and organizations from across the country and around the world to create better work environments. 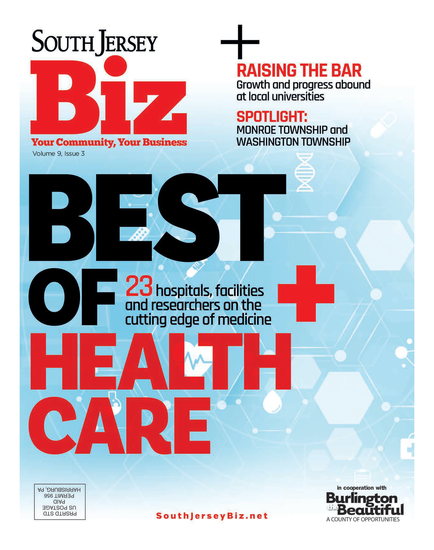 Under Backal’s leadership, Team Builders Plus has also been honored with several local awards, including fastest growing company in the Philadelphia region and in South Jersey. He is also now setting his sights on developing a sister company, Take Flight Learning, which is a company driven to develop individuals, teams and organizations through the power of the DISC personality styles. Zallie has grown a family business that started with two grocery stores—one based in Port Richmond, Pa., that opened in 1956 and another in Clementon that opened in 1973—and expanded its holdings to 10 Zallie ShopRites in the South Jersey and Philadelphia region. Helping the company to earn $600 million annually, he has also become an important piece of the Wakefern Food cooperative the Zallie ShopRites are a part of, and he participates in a number of local business and social organizations. Zallie says he is always working on “growing our company by way of acquisition of new sites,” and believes that smart growth is achieved by reinvesting in the business. He cites his father as his biggest inspiration. Riggs and Graphics Solutions have boomed in the world of local marketing and marketing production in the last three decades. Specializing in signage, communications support and graphic design, Riggs has become a key influence in professional promotion, providing the area with physical and visual elements that can take any business to the next level. Riggs’ company has grown across South Jersey, serving businesses and corporations like the South Jersey Transportation Authority, the YMCA of Gloucester County and even Gateway Regional High School and Rowan College at Gloucester County. Since Scholtz founded Innovative Payroll Services in 2006, the company has grown and evolved, and today offers payroll services nationwide. Scholtz’s fearlessness in the industry and his extremely open and interactive approach to all business endeavors has contributed to the success of IPS, and is what has ultimately helped him to start Tilgent, a company providing the newest technology communications for the workplace, with his wife and two daughters. Despite dealing with a lack of time, which he cites as his biggest business obstacle because “there is never enough of it in a day to accomplish all of the greatness I plan to achieve,” Scholtz is continuously striving to move his businesses forward. allRisk Property Damage Experts isn’t just another insurance company—co-founders Messina and Ragone have made sure of that. Messina, the son of Italian immigrants with a penchant for hard work, and Ragone, an alumnus of Camden Catholic High School and Rutgers and former finance professional, paired up in 1988 to found the Somerdale-based allRisk. Today, the company has grown to 65 employees and is one of the tri-state area’s leading commercial disaster-recovery contractors. The company is known for its caring employees, expert workmanship and response time—all highly valued attributes in times of crisis. And Ragone, who at age 16 suffered a spinal cord injury from a diving accident, knows what it’s like to achieve your dreams—no matter the obstacles. Through her family-owned business—which stands for Safety Outfitting Services—Falcone’s goal is to help seniors age in the place they feel most comfortable: their home. They provide custom home modifications such as handrails and grab bars, additional lighting and newly constructed bedrooms or bathrooms on the main floor so people with disabilities or illnesses can live independently in a safe environment. With more than 20 years of experience in construction, the transition to ADA compliance and handicap outfitting was a natural one for Falcone, who is also active in charitable causes. She was diagnosed with dermatomyositis, a muscular dystrophy disease, four years ago, and is a proud supporter of myositis research through the SOS online store. Sweeney founded National Employee Management Resources in 1996, and today, the Marlton-based employee leasing company serves clients in a variety of industries nationwide. But this didn’t come easy to Sweeney, who has more than 40 years of experience in the employment industry. She began her career by working for more than 20 years for two of the largest temporary help services: Olsten, now Adecco, and Manpower. In the late ’80s, Sweeney ventured outside her field and purchased a bar/restaurant, but just 18 months later, the owner of the Manpower franchises offered her an opportunity with the full-service employment agency in southern New Jersey. Sweeney became partners with Harris of Harris School of Business and Harris Employment Agency in Cherry Hill, eventually earning 50 percent ownership. Three years later, she founded National Employee Management Resources and the rest, as they say, is history. Clark has been a true entrepreneur throughout his career, with professional experience in public accounting, investment banking and the transportation industry. He considers himself an early adopter of digital processing technology, and since founding AmeriQuest Transportation Services in 1996, has used his vision to help commercial trucking companies reduce costs and optimize productivity through proven, efficient methods. With corporate headquarters in Cherry Hill and satellite offices as far west as Chicago, the company continues to grow, Clark says, “by executing our passion, which is to provide technology-driven solutions and domain expertise to companies of all sizes, enabling them to compete more effectively in their marketplace.” In addition to running AmeriQuest, Clark is also on the board of directors of the Truck Renting and Leasing Association and AAA South Jersey. Founded in 2013 by DeAngelo and Pike, RhythMedix has developed a new, wireless system that will completely change heart monitoring for arrhythmia patients. Normally, these types of patients are monitored with two separate devices—one to monitor their heart and one to collect data. RhythMedix streamlines this process by utilizing cellular technology so the data can be tracked wirelessly. Although the Mount Laurel-based firm is a small operation with only six employees, they have big dreams. Published (and copyrighted) in South Jersey Biz, Volume 4, Issue 9 (September, 2014).